Melt 4 tablespoons of the butter in a heavy saucepan and add the shallots. Cook until soft, but do not allow the shallots to color. Add the mushrooms and parsley and cook until soft, stirring continuously; set aside. Heat a separate saucepan. Melt a knob* of Kerrygold Irish Butter. Add the rice by hand, dropping it into the saucepan from a few inches above (this will blow some of the starch off). Stir the rice until it begins to roast a little. Add about 4 ounces of the chicken stock. Stir continuously until the liquid has been absorbed. Continue adding the stock, about 1 ladleful at a time, and stir until absorbed into the rice. Continue this process until the rice is al dente (has a slight bite). Remove from the heat and stir in mushroom mixture. 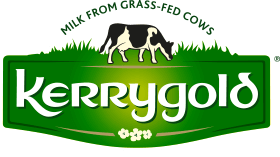 Add the remaining Kerrygold Butter and grated Kerrygold Dubliner® Cheese. Stir, allowing the heat to melt the cheese and produce a wonderfully creamy texture.